Digital television (DTV) is a set of new technologies and transmission standards that offer several advances over the analog television technology that has been used for more than a half-century of television transmission. Through the use of data compression, approximately ten times as much audiovisual information can be sent over a single channel, allowing for either much higher-quality video (high-definition television, aka HDTV), or multiple standard-quality video programs transmitted via a single channel. Digital television can be received via digital satellite television services, digital cable, or digital broadcast television. Availability of each of these services varies by country and region. Broadcast television, also called over-the-air or terrestrial television, is television received through an antenna such as the ones pictured at right. Several European nations have already completely switched over their terrestrial TV service to an all-digital format, and many others throughout the world are well into the transition or have near-term plans to switch to digital service. See Wikipedia:List of digital television deployments by country for detailed information about each country's plans. In the United States, the digital switchover is planned to occur on February 17, 2009; after that date, all major broadcasters will stop transmitting analog signals altogether. These broadcasters have already been broadcasting digital versions of their programming alongside the analog signals for several years. These digital signals can be only received via a digital tuner; such tuners are included in any new television set and some DVD recorders. Older (analog-only) televisions can use a digital converter box to receive digital programming. The US government has established a coupon program offering up to two $40 coupons per household good toward the purchase of such boxes (see Wikipedia:Coupon-Eligible Converter Boxes and the US government's FAQ on the program). Most converter boxes are being offered for about $60, and only one coupon can be applied toward the purchase of one box, so each box will cost about $20, plus taxes and shipping costs, if any. The coupons can be applied for online at https://www.dtv2009.gov/ or by calling 1-888-DTV-2009. The coupon cards must be redeemed within three months, and are processed by retailers exactly like a credit card (although it is nonrefundable), providing an instant $40 credit. According to a study performed in 2004, approximately 19% of US households receive television through broadcast signals only; to continue receiving television signals after February 19, 2009, these households must purchase a converter box, a new TV with a digital tuner, or subscribe to a for-pay cable or satellite TV service. These units may or may not be available in your local store, or even online. You might want to call your local retailer before setting out to see what they actually have in stock. Kmart and Sears do not list any boxes on their respective websites, although supposedly they both have the Magnavox/Philco TB100 available in some stores. A number of other online, telephone, and local retailers are also participants in the government's coupon program and may have different boxes available than those listed above. See https://www.dtv2009.gov/VendorSearch.aspx for a listing of vendors (fill in the "Locate Retailers Near You" form for additional local listings). Coupon-eligible boxes are limited in what features they can offer (only very basic video and audio connectors, for instance). Units with more features, such as DVD recorders, or units that can be hooked up to PC monitors, HDTVs, or other non-analog equipment are available, but you cannot use a coupon to purchase them. Units using LG's sixth-generation DTV chipset (the LGDT1111 family), including the Digital Stream, Insignia, and Zenith models listed above, will supposedly get better reception of signals, especially in areas with a lot of obstructions (buildings, trees, etc.) between the receiver's antenna and the broadcast antennas. The Insignia NS-DXA1 and Zenith DTT900 models are both manufactured by LG Electronics, and are essentially identical products. The Magnavox TB100MW9 and Philco TB100HH9, both manufactured by Funai, are also believed to be identical models. Users have reported audio artifacts (sibilance) in the high treble range on Zenith DTT900 and Insignia NS-DXA1 models. This problem supposedly has been fixed in units marked April 2008 and later. The Digital Stream DTX9900 may have issues with unwanted picture cropping in both "zoom" and letterboxed mode. A small of models offer "analog pass-through": this feature allows you to receive both digital TV signals and analog signals through the same video setup (and antenna). This feature is important if there are stations in your area that you wish to receive that have a good analog signal but a weak or nonexistent digital signal. Digital Stream DTX9950, Zenith DTT901, and Insignia NS-DXA1-APT models which incorporate this feature are due to be released in mid-2008, or may already be available. Standard-definition digital video (SDTV) is equivalent to the resolution available on a good analog TV set. HDTV is broadcast in two forms: 1080i and 720p. Both are widescreen formats, with an aspect ratio of 16:9 -- this means the picture is 78% wider than it is tall. (Contrast this with the 4:3 aspect ratio of older TV sets and SDTV broadcasts, where the picture is 33% wider than it is tall.) 1080i has five to six times the resolution of standard-definition pictures and 720p has more than twice the resolution. However, 720p is also broadcast at twice the frame rate: the picture is refreshed 50 or 60 times a second instead of 25 or 30 times a second. As a result, both 1080i and 720p convey about the same amount of visual information, with 720p being better-suited to high-motion programming such as sports. Although digital cable providers may provide local stations (including local affiliates of national networks), to save bandwidth, many provide a reduced-quality HDTV signal compared to the one that is available over the air. Some digital programming may be broadcast with Dolby Digital AC-3 surround sound. To experience the full benefit of this, your TV or receiver must include a Dolby Digital decoder and be hooked up to a 5.1 speaker system (five speakers placed in specific positions plus a subwoofer). Many broadcasters provide one or more subchannels in addition to their regular content; for instance, in the United states, ABC and NBC both provide 24-hour national and local weather coverage, similar to The Weather Channel; ION provides qubo (kids' programming), ION Life, and The Worship Network; PBS stations may offer PBS Kids, Create, PBS World, or other supplemental content; and many local stations offer supplemental content as well. The virtual channel of a station will not always be the same as its broadcast channel: Channel 7.1, above, might be broadcast on UHF channel 45. The virtual channel will only be displayed by your TV if it is able to receive the broadcast channel in the first place (at which point, it will automatically renumber the channel to its virtual number). When trying to locate a weak signal on a given channel, your TV must be tuned to the broadcast channel, not the virtual channel. When in doubt as to which is which, note that virtual channels are always in the x.x format and broadcast channels have no trailing number: 7.1 is a virtual channel, but 7 is a broadcast channel corresponding to the actual VHF channel 7. The digital format also allows broadcasters to provide program information and schedules along with their programming; most provide several hours' or days' worth of listings, usually including program titles, planned broadcast times, and often a short description of the content. This information is accessible through your receiver, in the form of a menu overlaid on the screen; how much information is displayed is dependent on what the broadcaster provides and how your receiver's program information menu is designed. Some receivers only display information about the program currently being viewed, or "now/next" information; others offer multi-hour, multi-day, or even 14-day grids. The biggest disadvantage of broadcast digital television is the digital "cliff effect": weak or variable signals which would provide a poor but still watchable picture in analog may be totally unwatchable in digital format. If the signal is strong enough, the digital picture will be perfect, but weaker signals will not produce any picture at all, and marginal or variable signals will produce intermittent loss of audio and/or video (and pixellation). These dropouts can be caused by something as simple as someone walking in front of the antenna or strong winds causing trees in your vicinity to move. The best defense against these signal dropouts is to use the best-quality antenna setup possible. ↑ Technically, "low-power" analog TV broadcasts will be permitted to continue after 2009; these stations are only available in limited areas and often carry only religious, ethnic, or other speciality programming. ↑ Technically, both 1080i and 720p are refreshed at 50 or 60 frames per second; however, in 1080i, only half of the screen is updated each frame. The refresh pattern is in the form of interlaced lines; odd-numbered lines are updated in one frame, then even-numbered lines in the next frame (hence, 1080i). 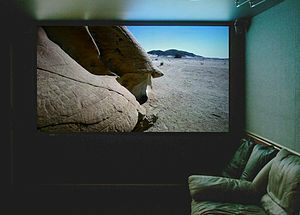 In 720p, all lines of the screen are updated every frame, providing smoother motion; this is known as progressive scan (thus, 720p). This page was last edited on 17 July 2018, at 03:05.